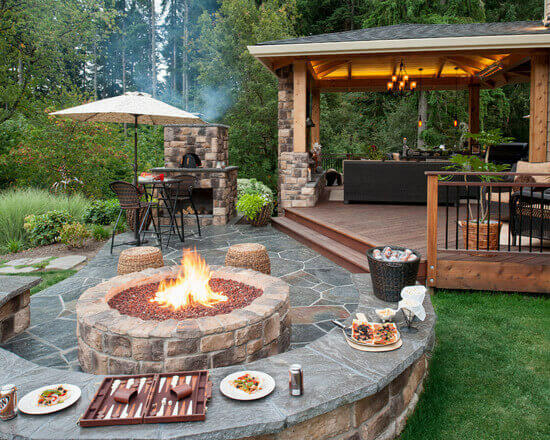 Summer is almost here and many homeowners are considering building a deck to increase living space and enjoy more time outdoors with family and friends. The most pressing question is how much does it cost to build a deck? Surprisingly, this is a reasonably priced construction project, with average costs ranging from $5,000-8,000 for a 250 to 400 sq.ft. deck. Most popular decking materials include Composites (Trex), pressure treated lumber, as well as natural wood, such as: cedar, bamboo, or Pine. Adding a deck also greatly boosts home value, and can bring as much as 70-85% return on investment if you decide to sell your house. Homeowners across the US, report spending $20-40 per square foot on a new deck, including labor and materials. This is about $6,000-12,000 for a 300 sq.ft. deck. This is a relatively cheap way to add extra living and entertainment space, especially if you compare it to the cost of building an addition, which starts at $125 per square foot. PT lumber is the cheapest decking option, cedar wood is middle of the road, while PVC composite and natural redwood are on the higher end of the price spectrum. Most expensive, however, are exotic wood decks made out of Ipe and Tigerwood. Here is a quick reference chart on the cost of building a deck of various sizes. The estimate also includes labor. Keep in mind that these prices are for a deck of basic design. Any extra materials, sealants, stains, etc. are not included. Moreover, there will also be additional expenses for building permits and blueprints, if you choose to do a custom design. Your location can have a major impact on the total price you will pay for an average size deck. For example, if you live in one of the cities on either East or West coast with a high cost of living (ex. New York), you will pay as much as $14,000 for a new deck. The same deck will cost $6,800. if you live in a city like Austin, Texas, and as little as $4,350 if you live in a town like Little Rock, Arkansas. You can get free estimates for your project from local construction pros. When it comes to pricing professional labor to construct a deck, complexity of design and functionality are key factors. The average deck size is 10×12 feet (basic rectangular design), and you can expect to pay $35 per sq. ft. for construction. However, if you want a different design, you can expect to pay a premium price for construction. In general professional labor charges make up as much as 60% of the total deck cost. Before signing the contract, make sure that you contractor includes a very detailed and itemized scope of work, as well as estimated dates of completion. Since building a deck is a very messy project, the contract should also discuss how trash and clean up will be handled both during the on-going phase of construction as well as upon finishing the job. Clearly doing a DIY construction can save you thousands of dollars – you can cut your total cost by at least 50%. However, building a deck is not a small feat, and requires a lot of prior experience, as well as equipment. In you live in a region that gets regular seasonal snow storms or flooding, its best to install a concrete pad under the footings, to provide additional support. Moreover if you have a very elaborate deck design, you may need a pad of concrete at the foundation to support the structure of the deck. The cost of pouring a slab of concrete ranges from $3 to $5 per square foot. 1. Platform (cheapest option): typically sits low on the ground, adjacent to the house. This location allows for easy and convenient access, and is fast and relatively easy to construct. With this design, it is important to ensure that all materials are treated for direct exposure to the ground to prevent rot and decay. 2. Tiered or Raised (more expensive): is also usually built adjacent to the house. It is ideal for a location with different ground heights, so it can conform to the ground’s contours. 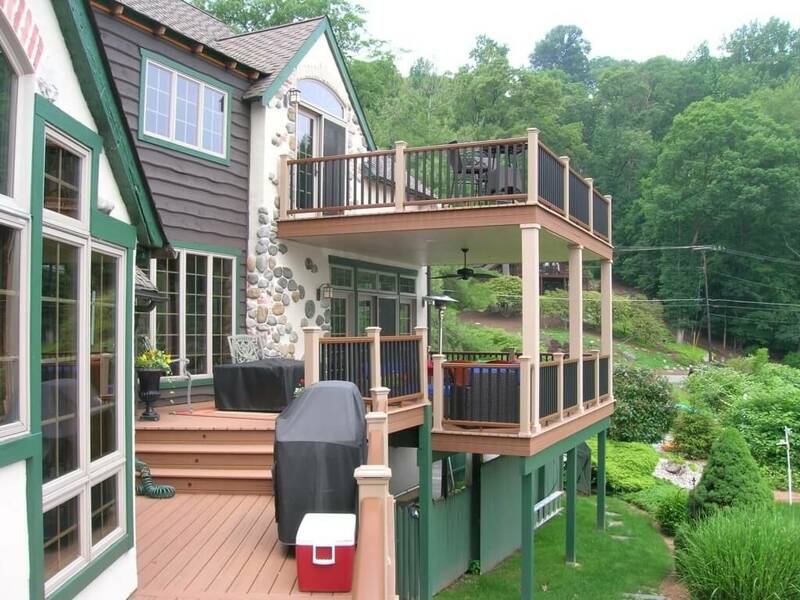 This deck is more complex to build and needs to incorporate a number of safety features, including railings. 3. Two-Story (very expensive): works best for a location with an easy access to the second story of the house, while the bottom portion allows entry to the first floor. Because of the complexity of the structure and additional supports needed for safety, this type of deck can be very expensive to construct. 4. Free-standing / detached (cost varies based on complexity of design): ideal, if your home does not have a natural location for an adjacent deck. Construction requires sufficient outdoor space, but it can include features, such as: multiple levels, storage units, gazebos, etc. For example, a free-standing deck with varying elevations, a hot tub and a porch, or pavilion can cost $50,000 to $60,000. Here is a price breakdown for popular materials used in deck construction. Note, that these estimates are for materials ONLY, and do not include installation and other extras. Also, keep in mind that the final cost of natural wood species will depend on the grade and board thickness (thicker boards will cost more). You need to budget for other common materials required to construct a safe and functional deck. Concrete $75 per cubic yard. Typically 1-2 cubic yards are required to build an average size deck. Standard stairs (labor and materials) $15-18 / sq. ft.
Safety railings (including pressure-treated wood posts and balusters) (labor and materials) $14 -16 / ln.ft. Build a flat bench (labor and materials) $20 – 25 / ln.ft. Build a bench with back (labor and materials) $34-37 / ln.ft. If you love to spend time outside with your family and friends, you may want to consider paying for additional accessories. These will make your deck a lot more fun to spend time on, both during the day and at night. Today, there is a wide range of both natural and synthetic man-made materials that you can use to construct a deck. Prices vary widely, and each material offers distinct pros and cons. We recommend investing into a high quality decking material that will not deteriorate withing a few short years. This deck is made from a blend of 30 to 50 percent recycled plastic with real wood fibers, and is virtually indestructible. Many can be installed with concealed fasteners, similar to dense hardwoods. Popular manufacturers include Trex, Timbertech, and Fiberon. – superior durability and resistance to warping, rot, mold and UV rays. Natural wood is a classic decking option. There is a wide range of species to consider, at different price points. Bamboo and cedar are budget friendly, while Redwood and Douglas Fir are moderately priced. Exotic species that are most expensive include Ipe, Tigerwood, Lacewood, and Cumaru. If you are considering a wood deck, make sure that its sustainably sourced. Many places that offer discounted wood get it from suppliers that use unsustainable logging practices and contribute to deforestation in US and around the world. – requires staining, weatherproofing, sealing and regular maintenance to maintain both looks and durability. If you are on a very tight budget, but still want to construct a new deck for your house, pressure treated wood may be the best option. Pressure treated wood is infused with harmful chemicals, so you should use a lot of caution and expect high maintenance if you want to safely enjoy this deck. – if PT wood deck is not sealed, its best to avoid walking on it barefoot. – since it is wood of the lowest quality, it will tend to warp, crack and split much faster than other types of wood. While offering all the benefits of expanded outdoor living space, a deck can actually increase your house value. On average, you can recoup about 70-80% of your investment into a high quality deck. While it may be very tempting to splurge on an oversized deck, you may not be able to recoup as much you would hope to. Most homeowners don’t really need a huge deck and are not willing to overspend on a house that has one. Moreover, unless you have a very large, high-end home, there is really no reason to invest into a fancy, oversized deck. Despite the fact that there are other durable decking options, real wood sill offers the best ROI. However, this figure largely depends on where you live, and how much time people in your area spend outdoors. Expert builders and realtors would advise against constructing a deck just to boost house value, as most homeowners view it as a nice extra, rather than a necessity. If you have an existing deck that is in poor condition and is not very user friendly, it is worth it to remodel it. This type of update usually bodes well with prospective buyers. However, if you do build a deck for your personal pleasure, you will likely get back a large chunk of the money you spent, if you decide to sell your home withing 3-5 years after completing this project. I’m not sure where you got $400 for 400 s.f. for materials. I ran 400 s.f. in the calculator, and get a low end price of $5941 for Massachusetts, pressure treated wood, leaving old frame in place. That is almost $15/foot. Please specify the section where we may have made a mistake.